Ok, I travel a lot for my job as a motivational speaker. 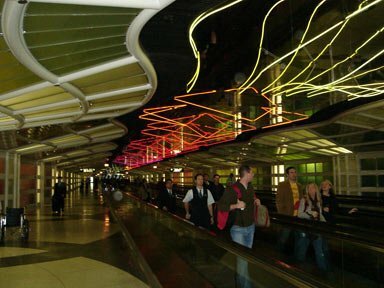 I admit that I HATE O’Hare airport in Chicago, Illinois. But there is one exception… I love this tunnel between the B and C concourses. It has cool neon, music twinkles in the background, and it generally makes me happy. I love that they put this type of tunnel art in the public place. I think it shows a good sense of humor. Illinois Motivational speaker and humorist. Your jokes stink? Speakers are Plumbers? Grab your hammer!